Our exclusive Travel Agent in North America. 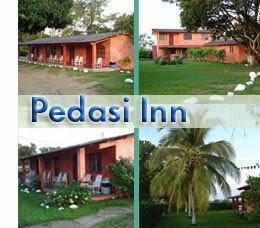 This lovely, 12 room, family-run hotel, is located in the center of town and is the best hotel in the town of Pedasi. Each of the cozy, rooms boasts 1 double bed, 2 singles, air conditioning, and a private cold water bath. Your hostess and proprietor, Prof. Gloria, will serve you breakfast before fishing early in the morning. Panama boasts some of the best coffee in the world. Garden hammocks provide the perfect location for a relaxing or taking an afternoon “siesta” (nap]) You will really experience life in this a friendly, uneventful little fishing village as it comes alive in early evening with come locals strolling the streets and kids playing in the central plaza. Villa Camilla is the canvas of Gilles Saint-Gilles’ a brilliant European architect who became enamored by the resemblance of Azuero to Africa in the dry season, the rolling Tuscan hills in the green season and the dramatic rocky shores of Panama´s Pacific coast. With patience and dedication anachronistic in our hurried age, Gilles and his team of European craftsmen began building on-site workshops and training local artisans from Pedasi with years of skills passed from generation to generations. Inspired by Azuero and architectural intellect, Saint-Gilles’ vision peddled his imagination, into what has become an unparalleled Central American masterpiece, Villa Camilla. 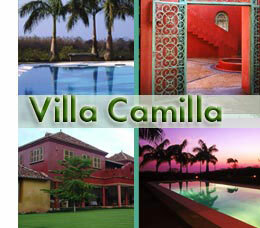 Villa Camilla is foremost, a work of art, and thereafter a balance of architectural beauty with the natural world. While staying at Villa Camilla, the effects of your surroundings and exposure to the elements of nature will make hours seem like days, inevitably leading guests to the secrets of what makes Pedasi unique, the simplicity of life in a small Panamanian fishing village. 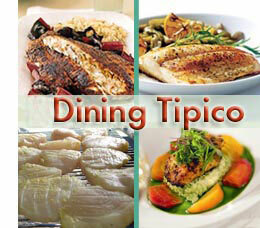 By Tipica we mean typical Panamanian cuisine. Panamanians eat a lot of rice, potatoes, grilled chicken and beef, and fried fish. Of course we will make arrangements to prepare your catch should you like us to do so. If you have any special dietary requirements, please let us know.